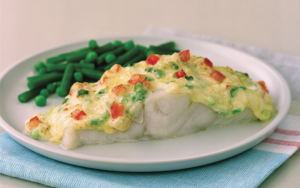 One of the easiest and TASTIEST fish dishes in the world – perfect for children and adults alike. Cut the tomatoes in half and remove the seeds, then finely dice the flesh and place in a bowl. Finely dice the cheese and add to the bowl with the spring onions, then just bind with the mayonnaise. Arrange the fish on a lightly oiled, sturdy baking sheet and season lightly, grill for 4-6 minutes until almost tender. Timing will depend on the thickness of the fillet. Tip: To check that it is cooked, gently prod the thickest part of the fish with the point of a knife and the flakes should separate easily. Quickly spread the mayonnaise mixture on top and flash under the grill for another 2 minutes or until the cheese is bubbling and golden. Serve immediately with a mixture of buttered green beans and peas and steamed potatoes.